Tjena ... oh Tjena! | Life, The Universe and ... Everything! A few months back I started organizing my shelves. 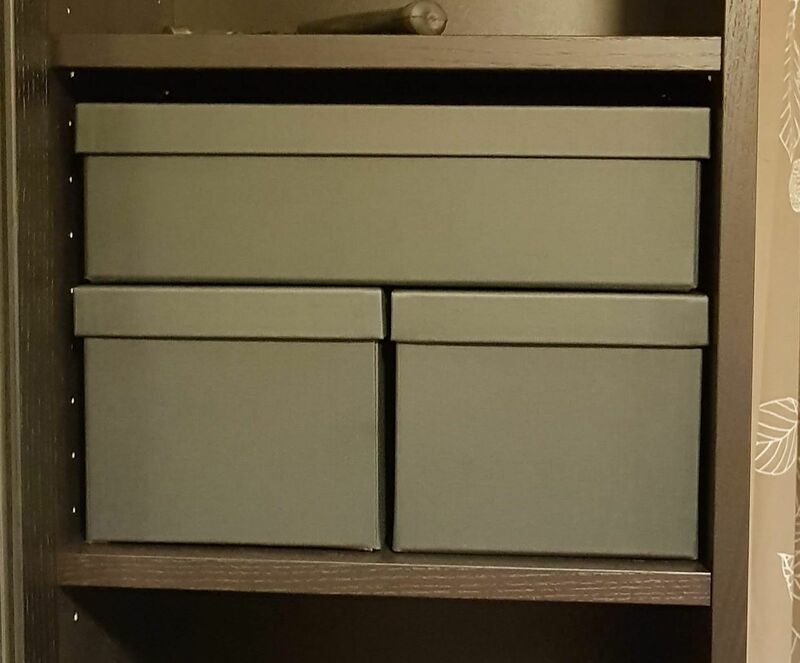 I standardised on IKEA TJENA boxes to keep my stuff in, and filled up a few shelves with them. 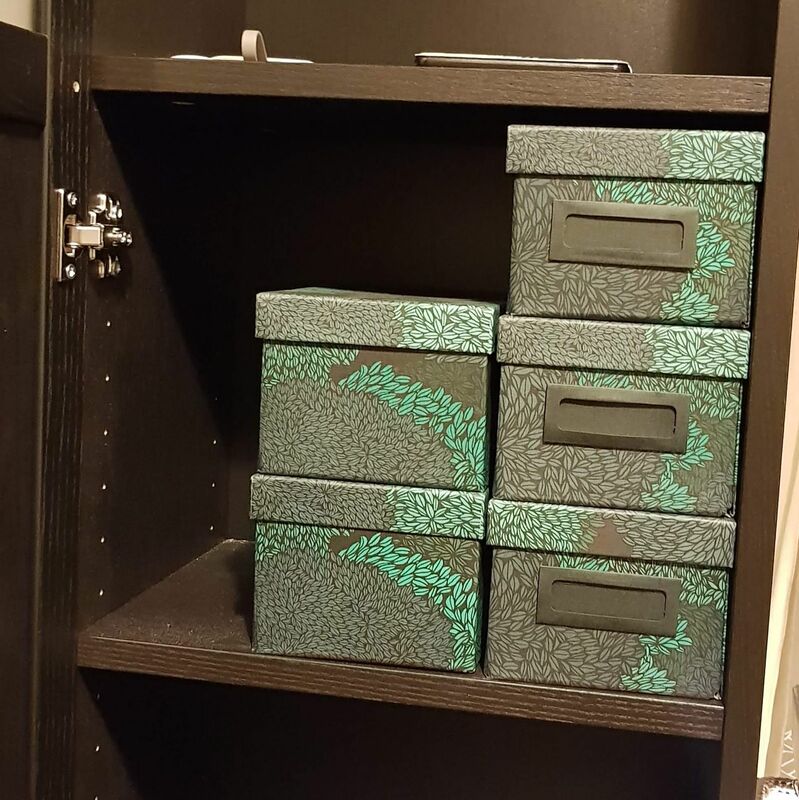 IKEA touts the smaller TJENA boxes as being able to fit inside a BILLY book case, because they are 26cm deep, and you can stack up to three of them on a shelf, assuming you divide the shelves evenly within the cabinet. So there is quite a lot of wasted space at the side, but I learnt to accept it. I've filled up about 50% of my storage space with these boxes, and so today I dropped by IKEA to get some more boxes, only to discover ... THEY'RE NO LONGER AVAILABLE! There is now a new series of TJENA boxes, so I now have the pleasure of dividing my shelves into "old" and "new" box designs. But that is not the end of the story, because not only are the colours different, but the new TJENA comes in different sizes than the old TJENA! You can now fit two New TJENA boxes across a Slim BILLY shelf, which is a very good thing. And they are slightly less deep, at 25cm. Probably this was done to make room for the hinges on BILLY's with Doors (UPDATE: not quite true, the hinges interfere with the boxes regardless. So it's just 1 cm of lost space). But if you've spaced your BILLY shelves evenly, as you can see in the picture above, you can't stack two of the new TJENA boxes in one shelf. They're too tall! So while you regain the lost space horizontally, there is now even more space wasted vertically. It's probably possible to adjust the shelf heights and get two new TJENA boxes to fit, but you're likely to end up losing one or two shelves this way. Or have one very short shelf.